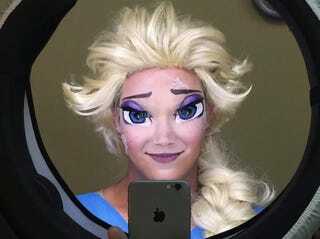 That's TV host, actor, and make-up artist Paolo Ballesteros showing off his Elsa from Frozen face. He doesn't always look like this. Nobody does. Here's what he usually looks like when he's not covered in cosmetics and not wearing a shirt. Based in The Philippines, Ballesteros has recently been making a name for himself online with his celebrity make-up recreations. He has well over 700,000 followers on Instagram, where he often shows off his latest celebrity make-up. Ballesteros, who hosts Filipino variety show Eat Bulaga, learned his make-up techniques from watching YouTube how-to vids. He told The Huffington Post (via Sofia Vergara) that the hardest thing was getting the nose right, but by drawing in the nostrils he can change the way his nose looks. Oh hi, photos I won't be forgetting anytime soon.